This tour combines 2 wonderful days of trekking with 3 days 2 nights in the southern side of Morocco. This tour is a perfect option if you are keen on an overnight trek in the Beautiful Atlas Mountains, Pathfinders will create a path that make you be an insider, get in touch with locals and learn a lot about their way of living. 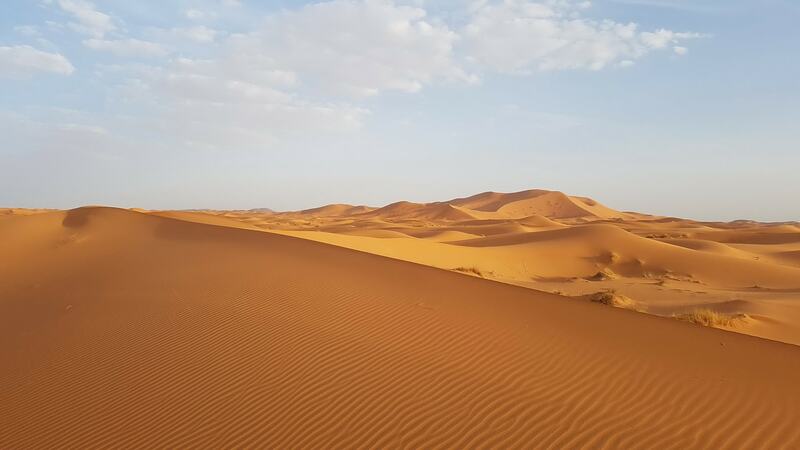 On the last 3 days of the trip, it’s time to be on the former caravan rout in order to visit the hidden Kasbahs and fortified villages of the southern side of Morocco, be a Laurence of Arabia and experience a camel ride through the golden dunes of Merzouga Erg Chebbi and spend a memorable night under stars. After breakfast you will start your journey towards the southern side of Morocco crossing the High Atlas Mountain range via Tichka pass (2260m), which considered as the highest mountain pass in Morocco, you will stop near the top to take some awesome photos of the snow capped Mountain etc…We will also have an opportunity to visit the UNESCO heritage site of Ait Ben Haddou Kasbah. Then pass through Ouarzazate; sometimes called Hollywood of Africa, since it has been a famous destination for filmmakers. After Ouarzazate we will continue to Dades valley where we will spend the night in a riad. Breakfast at the hotel. Transfer from the Dades Valley to Toudra Gorge - a massive fault dividing the High Atlas Mountains, rising up 300 metres in a narrow valley with palmeries and Berber villages. Here, you can go for a hike to explore the palm groves, a green oasis full of large date palms. After lunch you’ll head further into the desert to the gateway town of Merzouga to pick up supplies for your desert trip. You will then drive on to a kasbah to pick up your camel. At sunset, you’ll trek for an hour-and-a-half by camel to a Berber camp where you will enjoy a traditional Moroccan dinner, and sleep under the stars or in tents at a desert camp. Waking up early to enjoy an unforgettable sunrise over the golden dunes, and then ride camels back to the hotel in Merzouga, where you can have a shower and breakfast. Afterwards you will pass through Alnif, Tazzarine & along the Draa valley with few stops in some of its Oasis, before arriving to Agdez and then continue to Imlil valley (Atlas mountains) passing by Ouarzazate where you will stop for lunch, then via the Tichka pass. Overnight in a beautiful riad in Atlas Mountains. After breakfast At your riad in Imlil, meet the trekking crew (guide & muleteers). Then start the trek towards Azzaden valley via Tizi Mzik pass (2684m), spectacular view over Imlil valley including several neighboring high Atlas Peaks, Lunch will be served right at the top of the pass, after lunch a downhill walk to the Azzaden valley through juniper forest to get to Tizi Oussem village. Optional visit to the Ighouliden waterfall will be offered. Overnight at the Berber gite. 6 hrs walking. After breakfast, enjoy the sunshine on this colorful valley with its marvelous typical Berber villages, leave Tizi Oussem & continue down to Id Issa village, before heading up to Tizi Oudid mountain pass (2000m), cross Matat village after a wild juniper forest, get lunch under walnut groves and relax near the river. Transfer back to Marrakech.